A self adhesive label is an adhesive label designed to be affixed to another larger piece of paper or other objects. The front of the self adhesive label is typically made from paper sheet, thin film, or other special material, and the back of the label is a composite material which is coated with adhesive and silicone paper. When using the self adhesive label, you just need to peel the label from the bottom paper and press it onto the surface of other objects. Besides, labeling machines can be used in the production line for automatic labeling. Compared to traditional labels, self adhesive labels are pollution free, easy to use, require no paste, no gluing, and can be applied to all materials which common paper labels are unfit for. Commonly used self adhesive labels contain medicine labels, food labels, wine labels, battery labels, carton labels, shampoo labels, barcode labels, and so on. 1. Film based self adhesive labels: decorative decals for automobile, motorcycle; highway reflective film; markings on the container. 2. Variable information labels: batch number, order number, bar code, production date, period of validity, price, as well as distribution, warehouse management and inventory data. 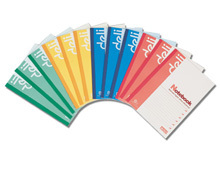 Thank you for your interest in the Deli Stationery website! As one of the major self adhesive label manufacturers and suppliers in China, we provide a wide range of products to suit each of our customer's needs. Some of our popular products are whiteboard, adhesive, calendar shelf, painting articles, and correction tape. With more than 20 years of experience, we are able to offer high quality office products at cost effective prices. Today, our products are well received in many countries and regions, such as the USA, Canada, Australia, Russia, Britain, Germany, Italy, France, among others. For any inquiries you have about our office supplies, please contact us by phone or email. We are certain you will be satisfied with our excellent products and service. Book EndA book end is an office product designed to support an upright row of books, thus preventing books from falling over, being bent or damaged. Bookends are of “L"shape, and are usually made of stainless steel, wood, etc. Painting Articles As an ISO certified manufacturer and supplier of painting articles, we at Deli Stationery are able to provide global customers with high quality painting articles such as oil pastel and color palette.